Fall has been so good to us this year! The weather has been absolutely wonderful and cool! The kids and I have been embracing this season both in the house and on family outings, trying to get into the seasonal spirit. Last week for our homeschooling project Marli had so much fun creating little pumpkins from construction paper and then drawing Jack-o-lantern faces on them. She was very proud of how scary they looked! While Marli worked so hard on her project I was busy cutting out by hand bunches of leaves to create a cute little fall banner to hang in the living room. It turned out really swell if I do say so myself! 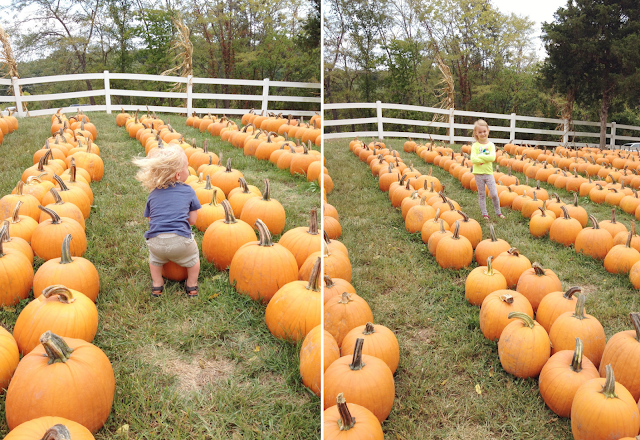 We also rounded up the troops and headed over to a pumpkin patch not far from our little town. We spent a good bit of time running around and looking at all the different pumpkins before settling on two pretty huge ones and two smaller ones for the kids. We are so excited to carve them! I will reveal the chosen designs on the blog soon but I will say that we are going with a very non-traditional theme. Here are some snaps from our lovely fall adventure! I hope you all are enjoying this lovely season! Tomorrow I'll be posting a little recipe so if you're starting to get sick of pumpkin flavored treats I have the prefect solution! So cute! Looks like you guys are having a great fall! I love fall, too. The air is crisp and just smells different. Current Projects // Simple Crocheting Workshop. At the Orchard // Adventures in apple picking. 23 // A birthday in photographs. Shop Update // Baby Gear. DIY // Instagram Photo Magnets.